If it can be said of the ultimate proving grounds of combat sports, there is nothing more closely associated with a roped platform famously referred to as The Squared Circle. Many martial artists invested blood, sweat and tears within the four corners of the ring just to have their hand raised and become legends in their respective fields. ONE Championship will be paying homage to the athletes who elevated combat sports to where it is today by having all bouts in its 13th venture on Philippine shores inside the promotion’s brand new five-rope ring. Aside from the marquee talents that will be featured at “ONE: Heroes of Honor” at the SM Mall of Asia Arena in Pasay City, Metro Manila, Philippines on April 20, 2018, the promotion will likewise introduce its new battlefield. All 11 bouts at “ONE: Heroes of Honor” will be held inside the new ring, including bouts that are officiated under the organization’s Global Rule Set. For the first time in ONE Championship’s seven-year history, mixed martial arts contests will be held in the ring instead of in the cage. Also making its debut at “ONE: Heroes of Honor” is the highly-anticipated ONE Super Series, a new iteration in ONE Championship’s efforts to bring martial arts to the forefront in mainstream culture. 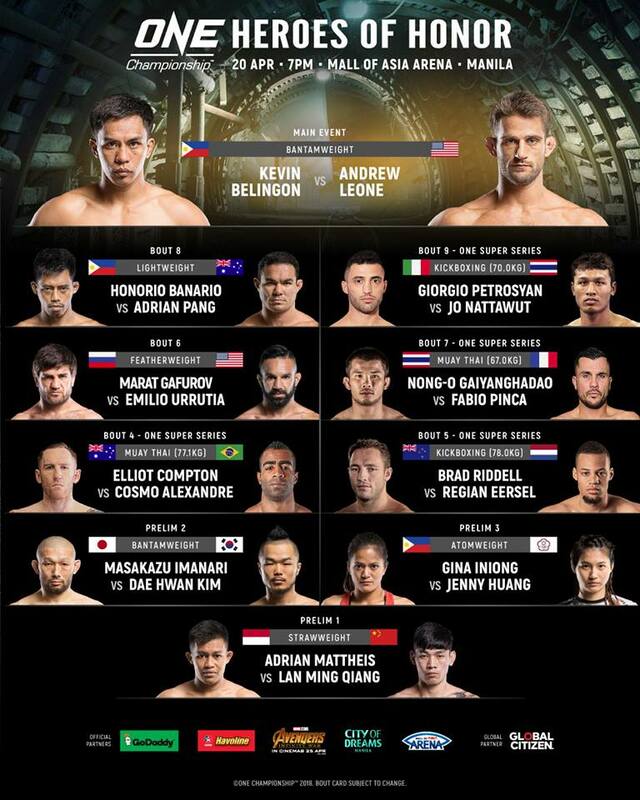 The premiere offering for Manila’s ONE Super Series is a three-round kickboxing encounter, featuring international superstar Giorgio Petrosyan of Italy who takes on “Smokin’” Jo Nattawut of Thailand. In other ONE Super Series match-ups, celebrated Thai kickboxer Nong-O Gaiyanghadao is scheduled to duke it out with French-Italian dynamo Fabio Pinca in a three-round Muay Thai tussle. Elliot Compton shares the ring with Cosmo Alexandre in a Muay Thai clash, while Brad Riddell locks horns with Regian Eersel in a kickboxing bout. ONE Super Series competitors will either use ten-ounce or eight-ounce boxing gloves depending on the weight of the athletes. Unlike its mixed martial arts counterpart, Muay Thai and kickboxing matches in ONE Super Series will be scored in a ten-point must system and will be contested in three three-minute rounds.